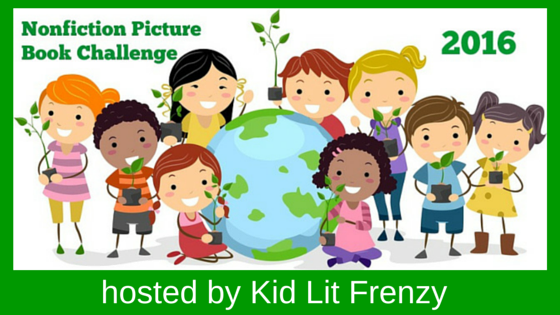 Here is a non-fiction book that would be a beautiful read aloud. I don't think you need to be studying Native Americans in order to read it, but middle grate students and up need to know this information, and to discuss different parts more deeply. Nelson has Sitting Bull tell his story and that of his people. With photos accompanied by the stylistic paintings of events on ledger paper, slowly we hear, we examine, and we are saddened by these stories, never told in the history books most of us grew up with. The ledger paper comes from the Natives being given old ledger books to draw upon when they were in jail. You might remember a book published some years ago titled The Ledger Book of Thomas Blue Eagle by Gay Matthaei, Jewel Grutman, and Adam Cvijanovic, or here is a link to works shown at the Smithsonian's National History Museum. 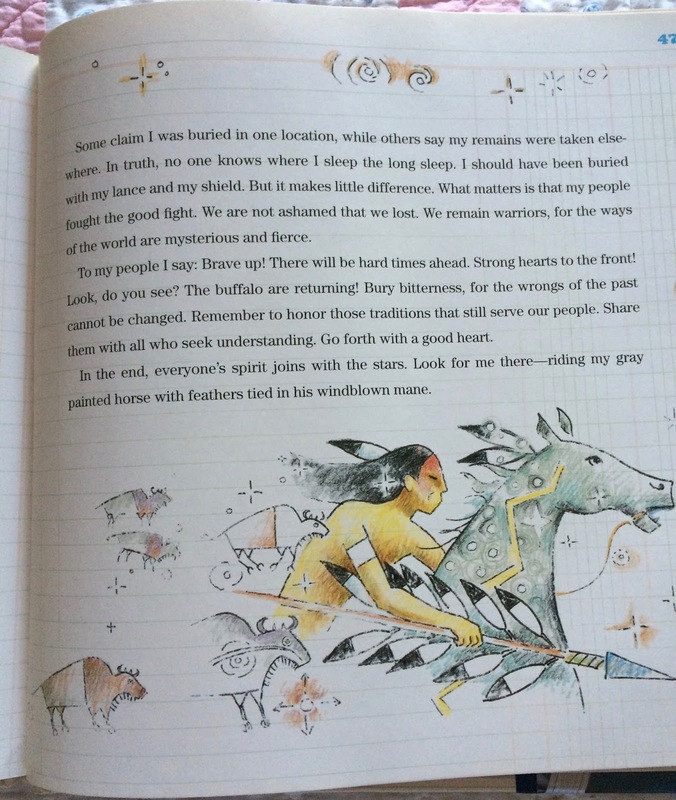 This book also gives a brief explanation of ledger art at the back. Because I recently read the middle grade book In The Footsteps of Crazy Horse by Joseph Marshall III, I especially enjoyed learning even more about this time, the beginnings of the white man's movement across the west, tearing into Indian territory and making it their own. Crazy Horse is part of Sitting Bull's story, as is Chief Red Cloud and others. Each page includes a quote in bold letters, photos presented like postcards, the story and the art. The ending shows the final blow because the white men were so scared that Sitting Bull would begin another uprising that they sent forty soldiers to arrest him. There was a skirmish, and he and his son Crow Foot fell dead. The quote: "He should have been buried in the old way--on a scaffold, safe from hungry wolves, in that high place reaching up to the stars at night." (Flying Cloud) No one knows where Sitting Bull was buried. 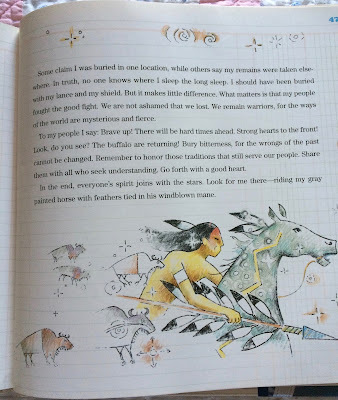 The opening endpaper shows a map of the area of this story, and the back end paper is another ledger drawing depicting a Sioux chasing a Bluecoat (one of the cavalry). 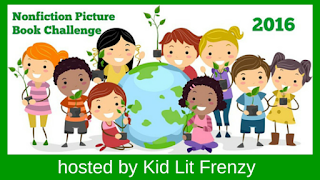 The story, the pictures, the art made me want to look again and again. S.D. 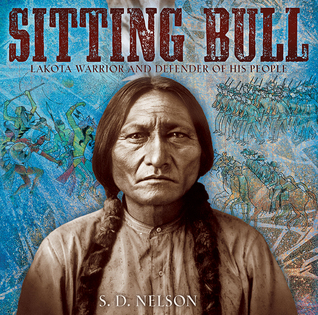 Nelson is a member of the Standing Rock Tribe in the Dakotas and has written numerous other picture books of Native American stories. Nelson has added an annotated timeline at the back, a lengthy author's note, a bibliography, endnotes, image credits and an index. It is a thorough work that could be a base mentor text for a lengthy unit of study. Thanks for this review, Linda. I'm intrigued and requesting it now. It's a wonderful book, Ramona. I hope you like it! Someone else reviewed this lately.... maybe Crystal? Sounds like a great source of information! I think Crystal, too, Michele. Then I found it at the library. It's very well done, and poignant too. Hope you enjoy it, Kellee.